Car Seat Weight Groups - Which? Car seat groups explained – everything from what a Group 3 car seat is, to what kind of car seat your five year old should be in. Child car seats are bought in two ways, either according to your child's weight or according to your child's height (i-Size). Moving babies and younger children up to the next seat up before they reach the maximum weight or height for their seat could lead to more severe injuries in a crash. Looking for car seats for one-year-olds? Looking for car seats for two-year-olds? Looking for car seats for three-year-olds? Looking for car seats for four-year-olds? Baby car seats (group 0+) are usually the first car seat you'll buy. They are smaller and lighter than the car seats you'll use as your child gets older. They are also rearward facing – so your baby will be travelling with his or her back to you when you're driving. Research shows it's safest for babies to travel rearward-facing for as long as possible. Group 0+ car seats will last your baby from birth until he or she is around 12 to 15 months old, with a maximum weight of 13kg for most baby car seats. Some group 0+ baby car seats are designed so that you can also attach them to a pushchair chassis to form a travel system. This means that you can take your baby from car to pushchair without having to disturb them too much. Our advice is to avoid keeping babies, particularly very young ones, in car seats any longer than absolutely necessary and never for sleeping inside the house. Group 0+/1 car seats will last your baby from birth to around four years old. Your baby will initially travel in the seat rearward facing and you can change the seat to face forwards. Some seats allow this from 9kg (approximately nine months) but we do not recommend you turn your baby forward-facing too soon. You should leave your baby in a rear-facing child car seat until they are least 15 months old. Many Group 0+/1 car seats let your child to travel rearward facing until up to four years old. 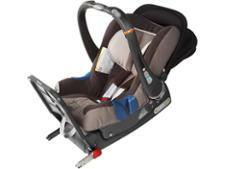 Unlike a baby car seat (Group 0+) a Group 0+/1 car seat will stay fixed in your vehicle. You won't be able to take it out and pop it onto a travel system chassis. Because they are larger than a Group 0+ car seat this type of seat may take up more space in your car. These are designed to last a child from birth to 25kg (approximately six years old). But we believe children change too much from birth to 25kg for one seat shell to adequately provide the protection they need at each stage. We've tested some very poor Group 0+/1/2 child car seats in the past, which fail to position the adult seat belt correctly on the child and could injure their neck and internal organs in a crash. 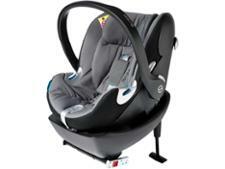 We currently have one Group 0+/1/2 child car seat review. Click on the link to find out why the Diono Radian 5 is a Don't Buy. Group 1 car seats are for toddlers weighing between 9kg and 18kg. That's from about nine months old up to around four-and-a-half years old. Many car seats on sale that are Group 1 are forward facing, although you can find some that let your child travel rearward facing until he or she is up to four years old. If your child is ready to move up from a Group1 seat the next seat up is a Group 2/3 high backed booster seat. Group 2/3 car seats are high backed booster seats. A group 2/3 car seat will last your child from 15-36kg. That's from about 3 years to 12 years. Most group 2/3 child car seats don't have a harness. Instead you'll secure your child and the seat using the car's adult seatbelt. Some models can still be installed using Isofix to keep them securely attached to the car. Some parents worry about moving their child from a Group 1 seat, which uses a harness, to a Group 2/3 child car seat using a seat belt, however there are a few seats available which have extended harness use, or other methods to help a child transition from a harness to a belted seat. 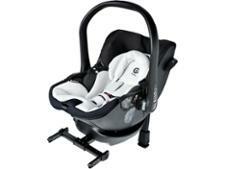 There are many Group 1/2/3 seats available, which can be used from nine months all the way up to 12 years (9-36kg). A car seat that covers more than one car seat group is also known as a multigroup seat. These allow you to secure your baby in a five-point safety harness initially, then the seat converts to a high-backed booster seat when your child is older and bigger. Multigroup car seats can appear to be a more economical way of buying a child car seat, as they will last your child for longer, but our testing has found that a seat which covers more than one group doesn't protect as well as it should throughout all three groups. However there are some exceptions. Some Group 2/3 car seats convert to a group 3 seat, which is a backless booster seat, also known as a booster cushion. You can also buy booster cushions separately. Booster seats raise the child's body to a height suitable for use with the adult seatbelt. A booster cushion satisfies the legal requirement for children up to 1.35m (approximately 4ft 6in) and they're cheap (about £6-£30), but we don't recommend them, especially for younger children. That's because booster cushions are not as safe as a high-backed booster seat with a full-length back and 'wings', which provide extra protection for the head and chest in a side-impact crash. It's worth paying a bit more for extra protection. From March 1 2017 the rules for using booster seats have changed. Any newly-approved backless booster seat on sale will be limited for use only with children taller than 125cm and weighing more than 22kg. But you might still see other backless booster seats on sale approved for use for children of between 15kg and 36kg. Both seats are legal to use as long as you are following what it says on the label. So always make sure you check the label before you buy. If you already own a backless booster seat you can still use it, as long as you're following the age/height on the label. Which car seat groups have isofix? You can find Isofix child car seats in all car seat groups from Group 0+ up to Group 2/3 car seats. You'll often see Isofix in Group 2/3 car seats referred to as Isofit. That's because there is a difference. In Group 2/3 car seats, even though the car seat is attached to the car using the same connectors, your child is kept in the car by the car's seat belt. In the lower car seat groups, the Isofix car seat is attached to the car using Isofix connectors but your child is kept in the seat by a harness that's attached to the car seat. Are Isofix baby car seats safer? It's better and safer to keep your child in the lowest group seat for as long as possible, rather than moving up groups too early. It's also more economical, too, as you won't have to splash out on a new seat until you've had the maximum usage out of your current seat. Do keep an eye on your baby or child's weight and height though, to make sure they aren't out-growing the seat too quickly. As you can see in the image of the little boy above. It's time to swap his car seat. A child will have outgrown a Group 1, 2 or 3 child car seat if his or her eyes are level with the top of the seat when sitting in it. In most cases, a child will reach the weight limit of a child car seat before becoming too tall for it, but all babies and children are different. Children at the bottom weight of each group are more vulnerable to injuries, this is why we don't advise you swap too soon. The recommended weights and heights for each group overlap, so we advise you to let your child reach the top limit for one group rather than swapping when they reach the bottom weight of the next. 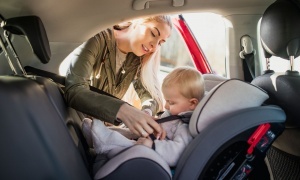 Parents are increasingly searching for a child car seat by age, but height and weight also need to be considered when buying a baby or child car seat. Some child car seats are approved for use by weight, and some are approved for use by height. Looking for car seats for one year olds? Your baby can remain in his or her baby car seat until either reaching the height or weight limit for the seat but many parents don't know this. 34% of the 5,316 parents we questioned about car seats in February 2018 incorrectly thought you had to change your baby’s car seat on his or her first birthday. Baby car seats are approved for use from birth up to the child weighing 13kg. Newer i-Size/R129-approved car seats can be used from birth up to the stated height on the seat – that height is chosen by the manufacturer. We’ve tested i-Size baby car seats with height limits ranging between 75 and 87cm. You don’t need to swap to the next stage before your child reaches 13kg if he or she is in a baby car seat, or has reached the height limit in an i-Size car seat. Don’t be tempted to turn your baby forward-facing too soon. With an i-Size seat, your baby won’t be able to face forwards any earlier than 15 months old. And some seats can keep your baby rear facing until the age of four, or 105cm, or 18kg. Looking for car seats for two year olds? If your two-year-old is still in his or her baby car seat but has outgrown the height or weight limits for the seat, then it’s time to upgrade. Some of the latest i-Size/R129-approved toddler seats now allow rear-facing travel until your child is four, which is considered by many experts to be the safest way to travel for young children. If you’re looking to swap from a baby car seat to the next stage, then an extended rear-facing child car seat is a good option. Group 1 toddler seats, approved to the older standard, may also be suitable as the next seat up, but many of these seats are forward facing. We’d recommend keeping your baby or toddler rear-facing for as long as possible, but we know some parents want to turn their children forward-facing to interact with them on car journeys. If you’re searching for a car seat for a two-year-old because he or she has already reached the weight limit for a Group 1 seat, but they’re too young to swap to a high-backed booster seat, then there are some other options available. The Joie Bold, for example, can be used with a harness up to 25kg, and some Britax car seats use a SecureGuard as an extra attachment point for the seatbelt. Whatever seat you opt for, we’d always recommend getting your car seat expertly fitted before you buy it. Looking for car seats for three year olds? Do you have a three-year-old already outgrowing his or her toddler car seat? If you’re searching for the next stage seat, we’d first recommend double-checking that your child’s current seat has been fully adjusted. Check the headrest height and harness height. Your child will have outgrown his or her toddler car seat when their eyes are level with the top of the seat when sitting in it (which means the head may no longer be protected in a crash). You don’t need to swap seats until this happens. Group 2/3 high-backed booster seats are approved for use from 15kg (which is around three years of age), but we recommend keeping your child in the lowest-group car seat for longer, rather than switching up a group too soon. Looking for car seats for four year olds? Group 1 toddler car seats usually have a weight limit of 18kg, or a height limit of 105cm for i-Size/R129 seats. This is usually around four years of age. If your child is starting to outgrow his or her toddler seat, it’s time to upgrade to the next stage seat. This will most likely be a Group 2/3 high-backed booster seat. These are forward-facing only, and the majority will use the car’s adult seat belt to hold your child in place, rather than a harness or impact shield. We’d always recommend getting your car seat expertly fitted before you buy it, so that you can check it fits your car and your child is happy sitting in it. UK law states that children must use a child car seat until they're 12 years old or 135cm/4ft 5in tall, whichever comes first. However, safety experts recommend that you use a child car seat for all children under 150cm/4ft 11in. This is the legal requirement in Ireland and some other European countries, such as Germany and France. Only an EU-approved car seat can be used in the UK. Child car seats approved outside of the EU (the US for example) cannot be used in the UK. If you're after a baby or toddler car seat, that's Group 0+, Group 1 or a combo of Group 0+/1, then a swivel car seat feature could be handy. 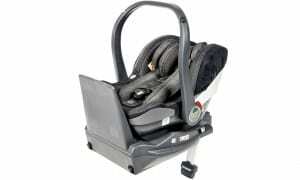 A swivel baby car seat is one which where seat can be rotated on the base. If you've ever struggled getting your baby in and out a non-swivel car seat you'll be pleased to know there are now more models which have this handy feature. Some child car seats have a swivel base to help you put your child into the seat, as you can turn it towards the car's door. Other car seats have a swivel base to make it easier to switch between rearward-facing and forward-facing. One danger of swivel car seats, is that some can be turned forward-facing too early without anything to stop this happening. Some car seats have a mechanism to stop the car seat being turned forward-facing too early, which is great, but others don't. If there is no way to stop the car seat being swivelled to the forward-facing position too early, it loses marks in our tests because of the potential for misuse.